This may sound like a joke but so many people who start their online journey are hit by this 2 words they don't know nothing about it "affiliate marketing". I know what affiliate marketing is already, however I've done more research about it few days in a raw and I'm confident that you will understand too. Affiliate marketing is a big thing, high performance business, where one big company rewards many affiliates for each customer brought with their own marketing efforts. 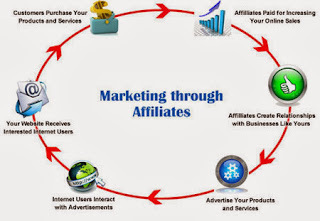 Affiliate Marketing is build from a merchant (known as retailer), a network (tracking analysis of offers and affiliates payments), a publisher (the affiliate who promote products or services) and the customer. Let's dig deeper and see some insights now! Affiliates efforts include organic search engine optimization (SEO), paid search engine marketing (PPC - Pay Per Click), e-mail marketing, content marketing and many more. Affiliates to earn money online often make misleading reviews to products or services that offer high commission per sale. Many retailers prefer affiliate marketing instead of buying bulk traffic via CPC, or CPM due to costs, may cause high loses of revenue this way so they choose to offer a higher commission to the affiliate who promote product and make sales or bring leads. Pretty simple at first sight, all things are easy once you learn them! Known as retailer, this is the company that offer a product or services, advertisers are ready to pay publishers a certain commission for every sale brought. This is a company or a individual person, also known as affiliate that promote advertiser products for a commission, this part of business is pretty hard when you don't have a capital or good ideas of marketing. This is the person that interact with the product promoted by the publisher, action can be to complete a simple form, buy a certain product or services.